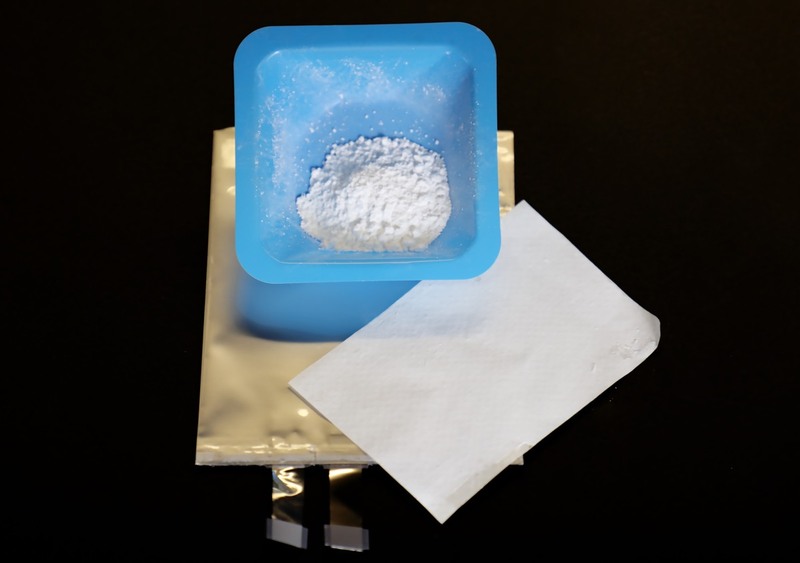 Enlarge / Adding powdered silica to the electrolyte used in lithium-ion batteries keeps them from catching fire. Exploding lithium-ion batteries can wreak havoc on airline flights or in waste facilities after people toss their old electronics into the trash. Now, scientists at Oak Ridge National Laboratory (ORNL) have come up with a new chemical recipe that could combat the problem. A lithium battery has two electrodes, separated by a thin plastic sheet and submerged in a liquid electrolyte—that’s a chemical medium (usually a flammable lithium-ion fluid) that allows charge to flow between a lithium-ion cathode to a carbon anode. When that thin plastic sheet breaks (due to too much jostling in the cargo hold of an airplane, for instance), the electrodes can come together, shorting out the battery. This produces heat, which can ignite the liquid electrolyte, and boom! You have a small fire in the cargo hold. That’s why the FAA prohibits anything containing lithium-ion batteries in checked baggage. In 2017 alone, the agency reported 46 incidents of exploding batteries on airplanes. Non-flammable solid electrolytes could solve the problem, but ORNL physicist Gabriel Veith says this would require a significant overhaul of the production process for lithium-ion batteries, a considerable capital investment that manufacturers might not wish to make. That’s why he and his cohorts are researching ways to tweak the conventional electrolyte recipe. The nickname is a nod to Dr. Seuss’ children’s tale, Bartholomew and the Oobleck, in which a magic spell gone awry causes sticky green stuff to rain down from the sky. The real-world oobleck is an example of a non-Newtonian fluid. Isaac Newton’s definition of an ideal liquid is one in which the viscosity (how much friction or resistance there is to flow) is primarily dependent on temperature and pressure. That is, water flows the same even if you apply a shearing force by stirring or mixing. American Chemical Society Press Conference. For non-Newtonian fluids like oobleck, however, the viscosity changes in response to a shearing force. Initially, the particles in the substance (in this case a colloid, where cornstarch grains are suspended in water) are loosely bonded, but any sharp impact causes the bonds to strengthen so the particles lock into place. Punch a bowl of oobleck, and it hardens into a solid, softening again as the energy dissipates. Technically, it’s a shear-thickening fluid of the sort used in prototype bullet-proof vests or the “smart armor” first worn by Canadian skiers in the 2006 Winter Olympics. Veith realized that this property could be invaluable in an electrolyte solution, which would solidify in response to impact and prevent the two electrodes from touching. The recipe is simple: just suspend sphere-shaped silica nanoparticles in the usual liquid electrolytes used for lithium-ion batteries, and your work is done. The tricky part is ensuring all the nanoparticles are the same size (200 nanometers in diameter); otherwise, it has the opposite effect and the liquid becomes less viscous upon impact (a shear-thinning fluid). “And that’s bad,” said Veith. (Again, ka-boom.) There’s a slight tradeoff in terms of reduced battery capacity and slower charging, but otherwise performance is comparable to the current crop of lithium-ion batteries. And it will only require a small modification to the production process.